If you’re an OU student then you’ve probably heard of OUSA but if not don’t worry, we’re about to explain. Do you know what the point of OUSA is and how they can help you? If you’re like me or many other students that I’ve spoken to then you may just be guilty of not really looking into it properly but listen up because you NEED to know about OUSA! I was lucky enough to visit the OU campus recently (Along with David who runs this site) and I found out so much more about OUSA and what they do. We were both impressed by them and wanted to tell you all more about them and why they are relevant to you. What Kind of Name is OUSA Anyway? It’s an acronym and stands for the Open University Students Association. As that’s a bit of a mouthful they are affectionately known as OUSA (pronounced OOSA) and I kind of like it. As The Open University is a distant learning facility and us students are based all over the world, we don’t get the same community spirit as those at ‘brick uni’ and that is something that students bring up time and time again. We accept it because what The Open University does give us is an incredible opportunity, but still, that community could only be a bonus. Well that’s exactly what OUSA is. It’s your community…your voice. They are there to mobilise a community of students from anywhere that they might be studying and bring them all together. They offer support, help, guidance and a lot of fun. Getting involved with OUSA is your ticket to finding other students like you. Students who are doing well, students who are finding it hard and students who are juggling a million things at once – they’re all out there. As already mentioned OU students are everywhere. The obvious way to reach out to as many as possible is via the internet: online activities, social media and more. The lovely team at OUSA are really friendly and are continuously trying to find new ways of letting students know that they are there. You can find them on Facebook, Twitter, the website, online magazines, Instagram and more! If you’ve found OUSA already then you’ve probably seen messages, pictures, comments and more. They post things and students comment back. That might be in the form of some information, a funny picture or one of my personal favourites: the ‘best overheard comments’ which can range from extremely profound to absolutely hilarious. Find them through one of their online mediums and literally start talking! You could start by taking a good look around their website. It’s packed with information and anything that you see on there is relevant to you. If it asks for nominations for your favourite tutor or people to help at the graduation ceremonies then that applies to you. Everything on there applies to you and you can respond to anything that you see, even if you’ve only just started with the OU. On the website you’ll find links to the online magazine (with tonnes of contributions from students – you can contribute too if you want to! ), the podcasts and lots more. If you see something you like, ping them an email and ask about getting involved. One of the easiest ways that I’ve found to get involved is to follow them on social media. They post lots of friendly, funny and light hearted comments. I see lots of students replying and have often found a smile on my face when I’ve felt despair at a TMA. Sometimes I tweet them with a question (literally anything study related, that I’m curious about) and they’ll retweet it out to all of their 13.4K student followers. You almost always get lots of really helpful responses, it’s fantastic! So hopefully I’ve helped to explain a little more about OUSA and what they are there for. They do even more than I’ve had room to explain and the team really are a fantastic bunch. 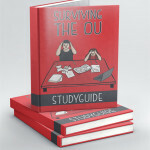 If you’re looking for ways to ‘survive the OU’ then finding OUSA can only be a bonus!